Fishing is an ever-changing monster. One day, pink's the color... the next, it's green. Is there something you want? In order to accommodate custom orders, I need to be able to personally contact you. Please use the form to the right to contact me. In the "Describe what you want" section, give a general description of what you want, and tell me how you prefer to be contacted (email or phone). I will contact you to clarify your idea and ask questions to determine whether I can make what you want. After we have pulled together your "custom order", I will create a separate skew number just for you, as pictured below. 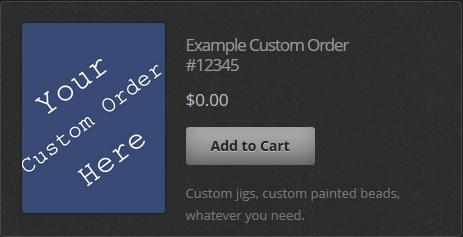 After your order has been completed (purchased), the custom order will be removed.